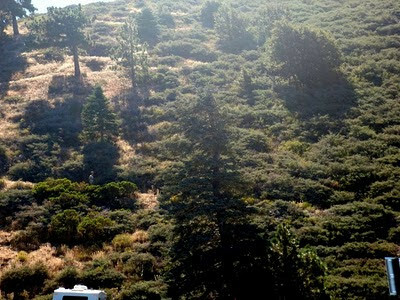 For me, Angeles Crest was a whole lot of things all at once. 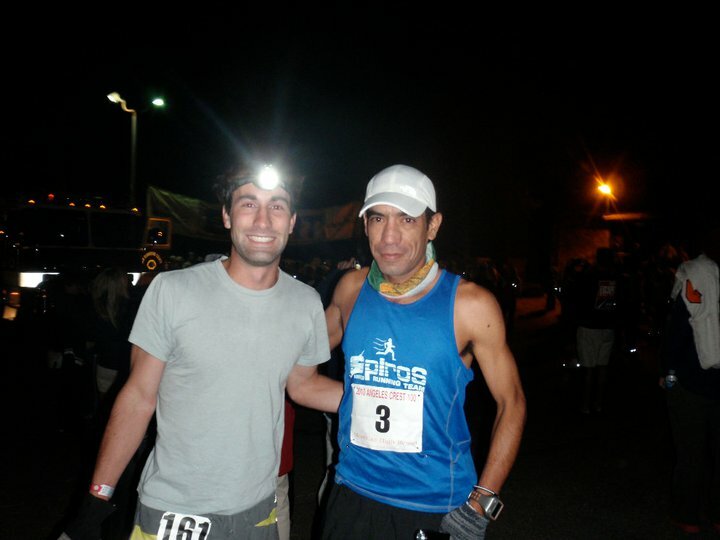 A month and a half ago, I had finished Badwater, the month preceding AC was filled with weekends on the course with Jorge Pachecho (3 time (now 4 time) winner), and I had spent more time day dreaming about this race than any other ultra to date. 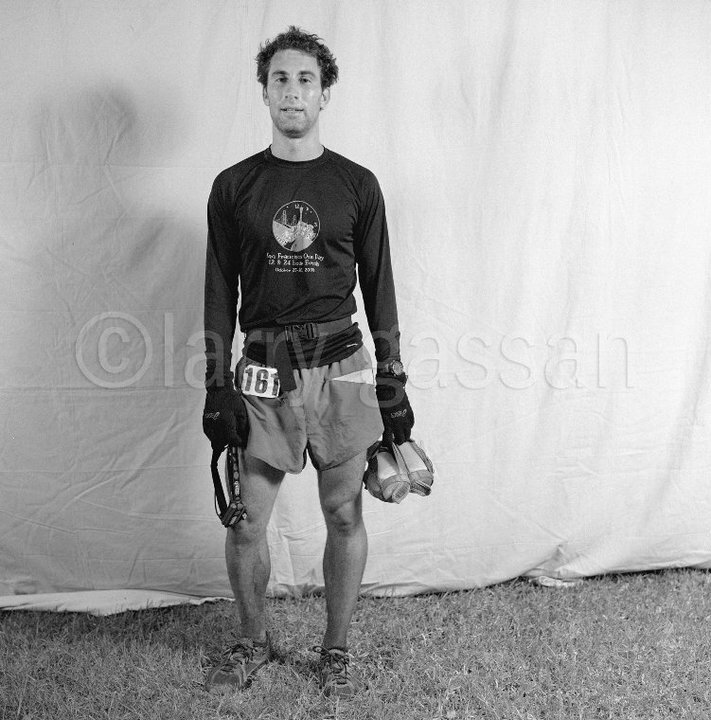 Since the year before when I had signed up and printed out the race packet, I had been disecting the course piece by piece and trying to mentally put together a plan to crack 24 hours or better. In running with Jorge, I learned that I really had a lot of fears that needed to be set aside for the sake of running very my best. Things are simple with Jorge: run your best, take care of yourself, try hard, there are no excuses, and suffer just a little more than everyone else is at that moment, and you'll be done quickly. Could I get altitude sickness, roll an ankle, run out of food/water, have anxiety attacks, get lost, etc. etc. etc? Yes. Would they definitely happen? Not necessarily (they actually did), but they were all risks associated with the race, and I had to learn to approach the event with courage and determination to run not in fear and actively chase my goals. However, being the youngest runner in the race, this mindset wasn't going to be the easiest as far as getting to Pasadena. The race is dangerous, and the course plays mind games with the runner that is too aggressive or too afraid. I knew, the "calculated hunter" who is familar with the terrain fares best, but staying in this mindset wasn't the easiest. With all these things on my mind, I set out Friday at 9:30 AM to check. I checked in at 11:55AM weighing in at 158lbs and set about packing last second drop bags and getting lunch and dinner situated. I wanted to be easy on my stomach, and though I thought I had eaten enough in the days before, I still was hungry and ate a burrito that night. I camped at Appletree with my Mom, Brian, Katie, and Craig, but the one other group at the camp site was involved in extremely "articulate and deep" conversation that included yelling, whining, drinking, and cursing.. By the time 3:45 AM came, I had a few hours of intermittent sleep, and was ready to get to the Start and get things going (the other group at the campsite was ready to go to bed then, so I think we were even (but not really)). I checked in, went to the rest room, and then relaxed in the community center staying warm with the other Coyotes waiting for the gun to go off. After wishing Jorge good luck, we took off into the pitch black early morning. I ran with him for maybe a half-mile until the hills started up and I let him go to work while I hung back with Rupuerto as we acclimated at our own rate, adjusting our pace to the steep early incline and altitude. As we began to leave Acorn St. and climb the Acorn trail, my calves began to seize up. 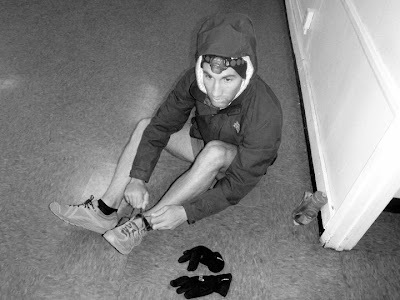 I was running as relaxed as I normally do at the start of a 100 mile race, but I hadn't done any climbing in the past 2-3 days, and my calves reacted to the incline in a rather aggressive way: seizing up so tight that they cut off the circulation to my feet. Nothing else hurt but my calves (and tingley feet), so I was naturally pretty frustrated. AC being a race with 48k of elevation change, I decided to shut things down and run/walked (while others passed) in hopes of getting things to calm down. Without much avail, I eventually made it up to the ridge, and began to get things back in gear as I pulled back into 3rd behind Rupuerto and Jorge. 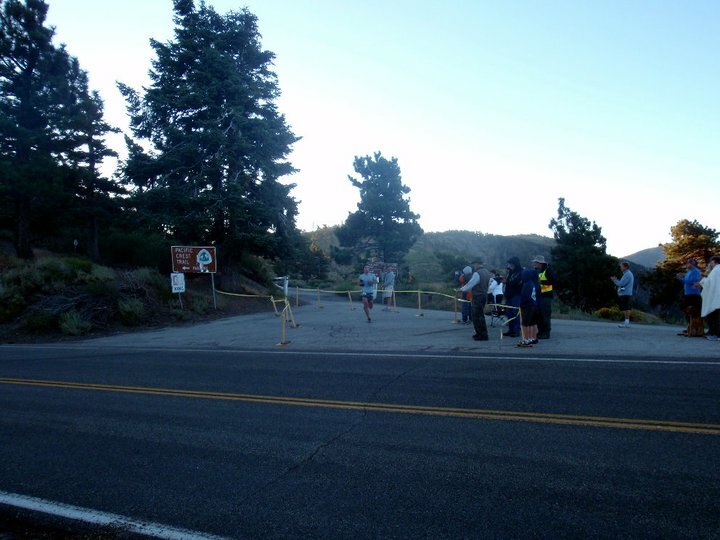 I came into Inspiration point in 1:42 and was a bit surprised as I thought the walking would have added a bit more time, but I still was on my goal pace of 19 hours. 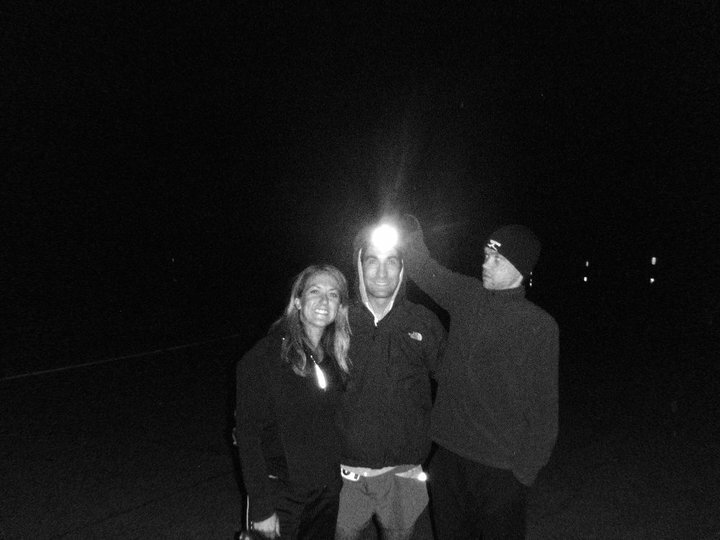 I dumped my gloves and light with my mom, switched bottles with Katie, and I grabbed a Gu from Brian without breaking stride. However, all the efficiency and speed in the world wasn't worth much as I slowly climbed out of the aid station choking on the Gu, and threw up my nutrition thus far (two Gu's, a ginger chew, salt stick, and some water). This wasn't normal at all. I had been sneezing a bit as we crested the windy ridge, and was reacting to a whirlwind of dust and pollen being swept out of the canyons. The temperature drop from 90-65 was causing a large mass of air (wind) to move through the San Gabriels, as well as collect all the plants' pollen that open their buds in the first 90 degree heat of the year. The AC was on full blast as the wind was relentless for the first several hours. I came into Vincent Gap with Guillermo Medina, and realized I needed to at least take care of my stomach if I could. I had some cucumber, but the altitude and pollen problem wasn't going anywhere despite my crew's best efforts to refuel me. I started the climb optimistically, but eventually was begging my body to just walk a casual pace over the top as several competitors who were admittedly "holding back" surged past me on a climb that I had run in 53 minutes in training, now taking me 78 minutes in the race. Yet, the situation was what it was, and I got back to work on the descent. Despite a few last bitter up hills between me and Islip (mile 25), I persevered to put down some good miles cruising through Windy Gap. However, this was a morning where nothing was going to be easy, and even on my favorite part of the course, a long 8 mile downhill, I fell for the first time. I learned early, that the course doesn't care if you've got a headache and can't focus clearly on the terrain, rocks have to be stepped over, and branches have to be dodged. I came into Islip trying to put my best smile on for my crew, but the altitude problems left me exhausted, frustrated, and hungry. Brian cleared some dirt out my shoes, Katie poured gatorade down my throat, my Mom cut cucumber, and Jimmy tried to break my back with a massage of some sort. Looking ahead to Mt. Wiliamson, Jimmy offered me his jacket claiming it was a cold and windy climb. I set off and made my best attempt to hike the short steep climb. If the climb up Badden-Powell was rough, Mt. Williamson was downright cruel. Every step took more energy than I had ever remembered, and the climb was again, the slowest I'd ever done. Once cresting over the top, the downhill that I had loved to scare Jorge on running through the narrow trail that cut through the land slides with reckless abandon was a giant obstacle course now. I treaded carefully trying to stay in control of my body and avoid any more plantar fascitis damage to my heel, or any more falls. 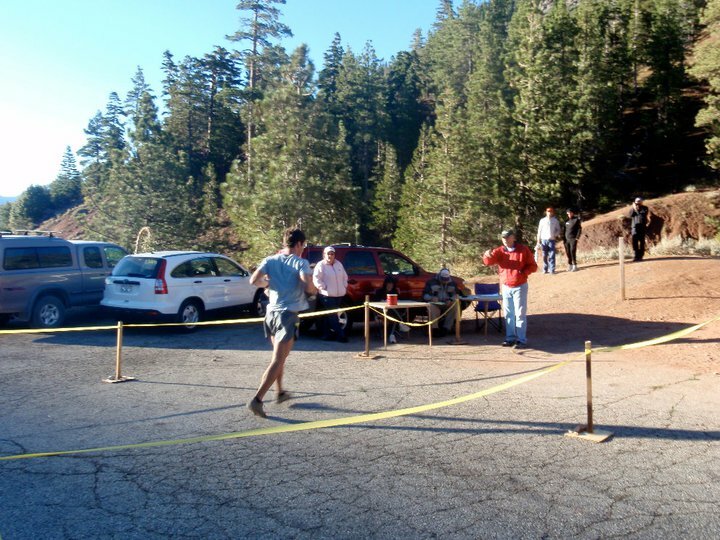 Coming into Eagle's Roost, I was glad to know the 8,000ft terrain was done with, and I set about eating as much as I could to begin my best attempt at salvaging a sub-24 hour race. The exhaustion I felt as this point was more indicative of a blown sub-24, but I felt like the next sections were as generous as the course would ever be, and I had to give it my best for my own pride and priniciples. Even if my first AC ended up being 26 something, I wasn't going to start sand bagging and say it was a wash to throw out the time. I invested money, time, and hard work to get to this point. I put in my ear buds, turned on the aptly titled song (and band) Strange Terrain by Circa Survive. The guitar chords struck a match on my soul and I turned my calculated hunter mindset back on and attacked Cooper Canyon. "nobody wants to sit behind the wheel, who's the one pounding the gears?" Like a prop plane slowly warming up, sputtering, and then roaring to life, I began to hunt down runners. Passing about 3-4 through the 7.5 mile Cooper Canyon, I kept as consistent an effort as I could without giving in too much to the good tunes. My legs felt new again, and the rest of my body took on a urgent forward lean that pulled myself up and over anything in its way. I had ran my slowest climb in my life up Badden-Powell, and now I was making up for it with my best climb through Cooper Canyon. I talked with Jonathan Gunerdson at the start of the climb out. He was having a bad stomach day, and still waiting for it to reset. We talked about being younger runners in these races, and his numerous Badwater/AC finishes. I wished him good luck, and pressed on determined to make up more time. The trail began to crumble towards the end, but I kept my head down and surging to keep the momentum up into the gentle climb up Mt. Hilyer. I reached mile 49 at 9:59 on my watch, but 10:03 according to the race personal at the aid station. I wasn't expecting to even split by any means, but I was happy to keep putting a buffer on 22 hour pace. Continuing up to Mt. Hilyer, Dean got ahead as I gingerly took my time getting down to the Silver Moccasin trail as the surging had zapped my technical legs a bit. Before I knew it, I was approaching the 1.5 mile descent on the Silver Moccasin trail to Chilao (52.5) that was a perennial favorite of mine during training. Jorge had enjoyed this section as well, but I really loved the banked turns and erratic path that never turned the expected direction, but opposite. I came into Chilao in 6th just 5 minutes back of Guillermo and Rupuerto, and was proud of how well I'd fought back to get to two talented runners who were still having a good day. I fueled up a little too much again with the Odwalla protenin fruit smoothie and made a gentle climb out before getting gingerly back into rhythm. Eventually I found my stride after a couple miles of puttering, and I made a good surge to pass another runner, sliding into 5th place. Even after working so hard for 24 miles at that point, I believed I still had the hunter mindset for another 46, and pushed the downhill to shortcut, and powered up the short and steep uphill to the saddle. Despite my best efforts, I was just behind the two other runners again. I picked up a waistpack with a bottle of the Odwalla Protein Fruit smoothie as it was doing a great job providing fuel and keeping my muscles happy without upsetting my stomach. I made a mistake eating a bit too much salty stuff and a gatorade leaving the aid station thirsty. I hadn't changed out of my mt100's and the long fireroad downhill wasn't particularly gentle on my feet. I can run downhill singletrack all day in the mt100's but fireroads offer less turns and succinct paths that allow the natural cushioning muscles to activate. Rationing out my water and keeping a gentle pace down to the east fork of the San Gabriel River, I felt relatively ready for the climb up to Newcomb Saddle (mile 68). I was amazingly energetic on the climb extending my walking stride out and running whenever I thought I could without using too much water. I hadn't ran the climb in 2 years (when I did it at night), and didn't know how long it really was. I knew I was moving fast, but there seemed to be more and more of the road around every corner. The sunset was amazing, and I kept smiling to myself despite my growing dehydration as I tried to squeeze more miles out of my water bottles. At the top I hit the last gate, and realized I had finally made it and saved an extra 10 oz of water foolishly. I waved to the CC camera hoping I might see my family, but they hadn't made it around the detour yet. I got a cup of soup, and prepared for the technical descent into Chantry. Technical wasn't nearly the word to describe the condition of the trail. Though some parts were runnable, most were bushwacking-leaf covered-rocky downhill miles. Coming into the base of Santa Anita Canyon, the canopy, the tall shoulder of the canyon, and the 8pm sunset made for a dark and painful traverse through the canyon. The base of the canyon itself has popular trails that are usually clear of leaves and gravel, but still contains a large population of boulders and large rocks 10 percent exposed. Loose rocks are one thing, but these iceberg like hazards demand the utmost attention from the runner. There's no getting 95% over these rocks without falling because.. there's no give! You may get most of all of your foot over one, but if you clip that little edge protruding on the edge of the rock, you go flying, or loose your rhythm and crash into the next rock. How I escaped the pitch black, iceberg strewn canyon with all my teeth, I'll never know.. But I do know that the canyon kept the front of my right ankle. Coming into Chantry Flat at mile 75, I was in definite need of some TLC. My Mom, Katie, and Jimmy all did their best to nurse me back to health, but the surging was done for the day. I still believed I was going to put a good effort in up the 3,000 foot climb to Mt. Wilson, but the tension that I had placed on myself running scared through Santa Anita, my aggressive forward lean was gone, and I found myself struggling to balance through another traverse of icebergs and dark turns. The climb that me and Jorge had torn to pieces a few weeks earlier was a complete monster. Instead of running most of it, I struggled not to walk and not fall back on the incline. I learned the true unique pain of Angeles Crest: The course always makes you earn every inch to every aid station from Wrightwood to the finish. Also, the second you show a flicker of weakness, the course seems to punish that exact weakness. For me hobbling along alone for another demanding 25 miles, the engulfing canopy made me feel more alone than I ever had in my entire life. Of course, the anxiety and loneliness I felt at the bottom were only going to get worse for the next hour as I climbed alone silently suffering alone in the dark. However, the end finally came. I started down the Mount Wilson toll road to the Idlehour Aid station, but still felt so incredibly lonely and weak despite the light glow from the city. The downhill was trying to snap the tendons in my ankle, and I felt even more alone knowing the next signs of human life were just a 3 quiet aid stations inter spaced over the next 5+ hours of darkness, solitude, and painful trails. I came in haggard and immediately tried to negotiate a little more rest before continuing on. The aid station personnel were veterans that knew what this station meant to every runner every year: not quite in the home stretch, and not quite much energy left = a good place to rest and waste time and maybe drop? 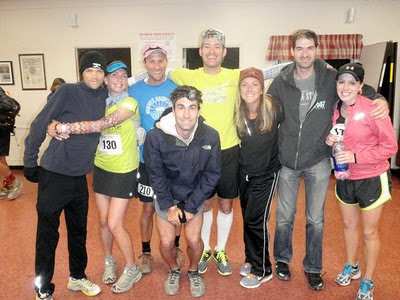 However as luck would have it, there was a foolish runner who had wandered up to the Idle Hour aid station to take in the proceedings for the night. Initially Andy Salinger was taken aback. His thought process was still in the, hang out and watch some courageous knackered souls come through all night long from a comfy chair. However here was one of the best cases for the need of a pacer: the youngest runner in the race who was 81 miles deep and on the verge of falling off 24 hour pace. Andy said yes, and we started off, but he realized he had forgot something at the aid station and ran back. As I was cautiously descending into the poison ivy infested canyon, I wondered just how messed up these aid station folks were who were eagerly pushing me out. Of course I wouldn't come back for a pacer but, damn if they were playing a trick on me, I was gonna hunt them down someday and tell 'em those specific thoughts in my mind at the time. Luckily, Andy was back withing 10 minutes and we were making decent time navigating up through the bermuda triangle nature of Idlehour canyon. I'm not sure how it got it's name, but it really feels like you're going nowhere for a good hour. The lights of Mount Wilson never seem to get closer or farther, and you seem to keep crossing over the same stream from north to south three times over. Luckily Andy knew how to pace and he talked up a storm to keep my mind engaged. We found out that he had taught at my high school the year before I began attending and that we knew a lot of the same people. Considering how small my school was (500 people) and how unlikely it ever is to know some other crazy person in ultra running, it was kinda cool (however this would happen again 3 weeks later when I paced at Chimera). We were passed by Dean early on, but then he was confused by the 3 stream crossings and would bounce back to us a couple times with his pacer Evan Hone who was equally confused. Eventually they pulled away when things got clear, and I managed a half-hobble-half-run into the aid station at Sam Merrill. The aid station was dead asleep at the hour, and we refueled quickly and began the technical downhill that I had been looking forward to (not longily) all night long. Despite the severe pain in my ankle, I managed to engage enough muscles in my back and quads to hobble down the worst of the trail rather quickly. However as we winded down to the long gradual uphill traverse across the side of the mountain that was actually very runnable, I couldn't seem to muster enough strength to push along. A runner behind me started to catch up, but then seemed to be having the same problems with the simple terrain. Just as we reached the other side of the traverse, I began to think maybe I'd be done before 23 hours. My memory (though seared with painful lessons throughout the day that any other normal person would remember) was failing at that time of night, and I began to think once we had crossed the road that we had a relatively short section into Millard (95). Reminder: ANGELES CREST NEVER LETS UP. The trail was about as bad as it gets for someone in my weakened state. From the ground up, it was just awful. Plenty of lose and not so lose rocks, weeds growing up over the middle of the trail hiding the hazards below, and then pockets of mist making things nearly impossible as the trail hugged cliff that wasn't lined with mattress pads at the bottom. But Andy never gave up on me, so I didn't either. I told him a 100 times how I couldn't understand how Hal wouldn't make sure this section of the trail would be in better shape after everything a runner had to go through to get to that point. Yet, as Buckaroo Bonzai would say "no matter where you go, there you are!" and there we were indeed: in the thick of a 19th round fight with a dirty Russian prize fighter. So we sucked it up, and then sucked it up some more, and took a few more punches, and then a few really dirty sucker punches, but the trail (Dirty Russian Prize Fighter) was taking a beating too, and before I knew it, I practically had the knockout at Millard. One awake aid station worker promised just 1.5 miles of single track down the El Prieto trail (though I knew it had to be more from previous runs) and we were off, hobbling down the last 5 miles of the race! Once again, the race mantra was in effect and I was hobbling across a haphazardly rebuilt El Prieto trail that winded over a creek bed many times over for no particular reason. No staying on one side and shooting straight home, no it was more like the perfect time to dance from left to right up the sidewalls of the canyon like it was the Olympic Half-Pipe competition and I was the rider from Bermuda who couldn't figure out which was was least painful. Also, the courageous Mr. Josh Spector was taking apart AC as his first 100 mile, and in doing so, closing in on me. Though he is perhaps the nicest guy in the world (seriously, he wore a pink hat all day and no one made fun of him because he's just that nice), I was feeling threatened in my sleep deprived barbaric state and took off on the last wild hare I had in me and Andy and I gunned it into the finish throwing in some stretches below 7 minute pace (which felt like sub 5 minute pace). We rounded the last corner and starting running towards the finish line area. 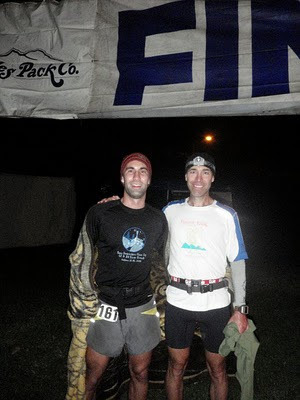 There was no markers or anything across the field in the park, but nothing seemed to matter at that point as we crossed the line in 23:07 and ended a long and painful day in the San Gabriels mountains. For now, I could look up at the mountains and feel some sense of accomplishment in mountain running skills, but still admit complete humility at how hard the course tested me. Congrats buddy, you conquered a great and tough course, you are having a fantastic year of accomplishments. I look forward to hearing the stories in person. Recover well and make it back up to SF sometime soon. Great race summary! Enjoyed reading your account! I hope to run the AC some day! Congratulations on sub 24! Great report Dom, a thoroughly absorbing read. You did incredibly well considering how bad you felt so early on, great experience, well done!